A collection of stones outside a deceased persons hut, in preparation for the raising of a grave mound over the burial site (mura) close by. The hut is dilapidated since the pumbó or mortuary feast at which the mound is raised is often a year or more after burial. 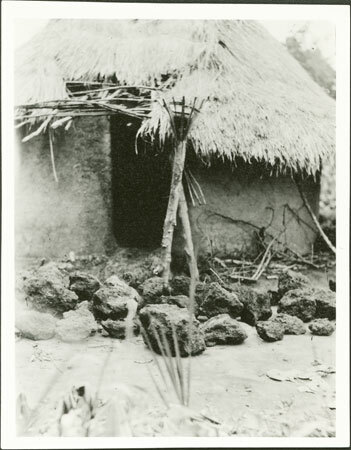 In front of the doorway is a tuka or spirit-shrine where medicines (ngua) are invoked to ensure ancestral (spirit) favour for the inhabitants of the homestead. Morton, Chris. "Zande spirit-shrine with grave stones" Southern Sudan Project (in development). 03 Jan. 2006. Pitt Rivers Museum. <http://southernsudan.prm.ox.ac.uk/details/1998.341.384.2/>.